If 2016 and 2017 were all about international payments, it seems 2018 and beyond will be focused on the regulatory technology needed to support those payments. As the international payments world rapidly expands, a growing area of focus has been the challenge of KYC and AML regulations. As we recently discussed with Chris Humphrey, CEO of RationalFX, new technology has the potential to make compliance easier. 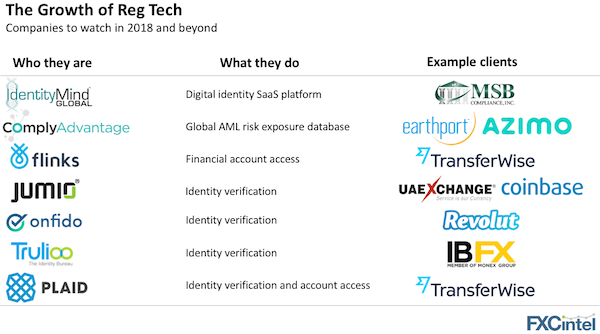 We decided to highlight some the different companies helping the international payments world solve the challenges of KYC and AML. You’ve probably heard of some of them, such as ComplyAdvantage who have Azimo and Earthport as clients. Some you may not be as familiar with, such as Trulioo (collected $23.3m to date) who works with IBFX, or Jumio (collected $55.4m) who works with both UAE Exchange and Coinbase. The companies below all have a major focus, or division, centered around international payments. It will be interesting to see where else regulatory technology pops up in the coming months as international payments companies enter the next wave of growth.